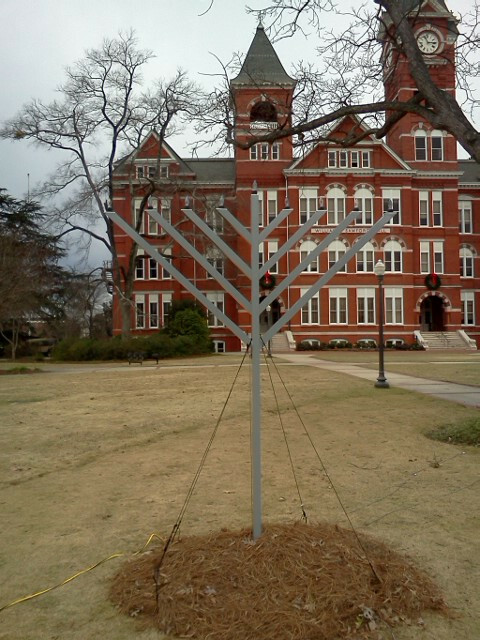 Reader Josh Dowdy asks via Twitter if this fine looking menorah—or personorah, as it’ll probably soon be known—has been on display on Samford Lawn in Holiday seasons past. Hmmm… mostly of the relevant Google results for Auburn+Samford Park+Menorah from 2012, all referencing an Auburn Hillel Chanukah Party—Auburn Hillel is AU’s Jewish student organization—and menorah lighting on the lawn on Dec. 1. But WTVM mentions a menorah as part of the 2006 “Holiday Celebration Featuring the Lighting of the Christmas Tree,” so named to avoid controversy after the great Holiday Tree Lighting firestorm of 2005. Regardless, it’s the first time it’s on display at TWER. That’s what important. Filed Under: Campus, Photo of the Day: Auburn Scenery, Screen Caps, etc. Interesting. No protest was made over the personorah at all? I want to know where the Auburn Festivus Pole is located!